Many commercial strawberry cultivars are susceptible to the red stele fungus. This root rot disease has become a serious problem facing strawberry production in the northern two-thirds of the United States. The disease is most destructive in heavy clay soils that are saturated with water during cool weather when the fungus is most active. The red stele fungus can survive in soil for up to 13 years or longer once it becomes established in the field or garden. Figure 1. 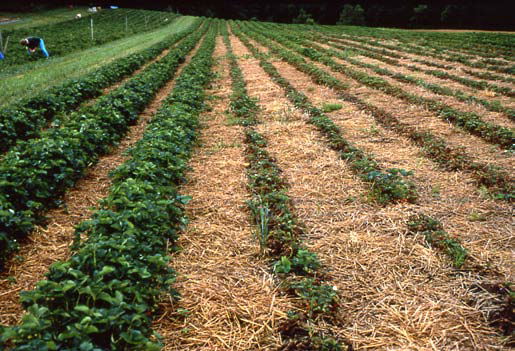 Strawberry field affected with red stele root rot. Susceptible variety on right, and resistant variety on left. Normally, the disease is prevalent only in the lower or poorly drained areas of the planting; however, it may become fairly well distributed over the entire patch, especially during a cool, wet spring. When plants start wilting and dying in the lower portions of the strawberry planting, the cause is very likely to be red stele (Figure 1). Infected plants are stunted, lose their shiny-green luster, and produce few runners. Younger leaves often have a metallic, blueish-green cast. Older leaves turn prematurely yellow or red. With the first hot, dry weather of early summer, diseased plants wilt rapidly and die. 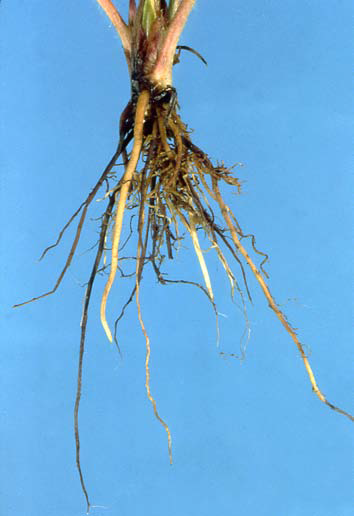 Diseased plants have very few new roots, when compared with the roots of healthy plants that have thick and bushy roots with many secondary feeding roots (Figure 2). Infected strawberry roots usually appear gray, while the new roots of a healthy plant are yellowish-white. The most reliable symptom of red stele is found within the roots and may be observed by gently digging up a few plants that are just beginning to wilt, taking care to preserve the root system. Plants with red stele usually have few fine lateral roots so the main fleshy roots have a “rat-tail” appearance. During intermediate stages of disease development, these fleshy roots will be white near the crown of the plant but will show a dark rot progressing upward from the tips. When the white outer portion of the root just above this rotten zone is peeled off or sliced through, the root core (or stele) will appear to be dark red (Figure 3). It may be necessary to examine several rotting roots before finding a red stele, but this symptom is very distinctive and is diagnostic for the disease. Reddened steles are relatively difficult to find after harvest because most infected roots have died and begun to decay by then. Figure 2. Strawberry root system affected by red stele. Red stele is caused by the soilborne fungus Phytophthora fragariae. This fungus is not a natural inhabitant of most agricultural soils but probably is introduced on nursery stock or by the movement of infested soil and runoff water from fields in which the disease occurred previously. P. fragariae is very persistent and can survive in a field for many years once it has become established, even if no strawberries are grown during that time. The organism that causes red stele of strawberry is not known to cause disease on any other crop, with the possible exception of loganberry. P. fragariae persists in the soil as thick-walled resting spores (oospores). When the soil is moist or wet, some of the oospores germinate and form structures called sporangia, which are filled with the infectious spores of the fungus (zoospores). These microscopic zoospores are released into the soil when it becomes completely saturated with water (flooded or puddled) and use tail-like structures to swim short distances through water-filled soil pores to the tips of strawberry roots, to which they are chemically attracted. Zoospores also may swim to the soil surface, where surface runoff water may carry them relatively long distances. Zoospore activity may occur at soil temperatures ranging from about 38 to 77 degrees F (4 to 25 degrees C), but is most significant from 44 to 59 degrees F (7 to 15 degrees C). Thus infection is most likely in the spring and fall. Once zoospores have infected the root tip, the fungus begins to grow up into other parts of the root, causing the characteristic dark rot and red stele symptoms. New sporangia are formed along the outside of infected root issue and release additional zoospores whenever the soil is saturated, thereby continuing to spread the disease. The fungus produces oospores within infected roots as they begin to rot and die, and these oospores are released into the soil when the roots decay, thus completing the disease cycle. Figure 3. 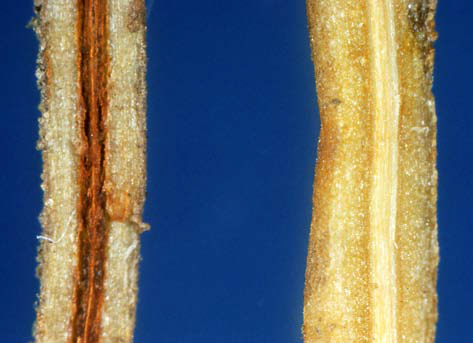 Section of an infected strawberry root (left) showing discoloration from red stele disease. Healthy root on right. Since significant production and movement of infective zoospores occurs only during periods when the soil is completely saturated, the key to control is drainage. Strawberries should not be planted in low-lying or heavy soils where water accumulates or is slow to drain. On marginal soils, planting strawberries on beds raised at least 10 inches high will bring much of the root system above the zone of greatest pathogen activity and the severity of red stele root rot should be significantly reduced. Strawberry varieties highly resistant to red stele should be seriously considered for planting in a marginally drained site or a field in which red stele has been suspected of occurring in the past. Only resistant varieties should be planted in a field where red stele is known to have caused losses within the last five to 10 years. The following June bearing varieties are reported to be resistant to Red Stele: Allstar, Delite, Earliglow, Guardian, Lester, Midway, Redchief, Scott, Sparkle, Sunrise, and Surecrop. The everbearing varieties are also reported to be resistant. All “resistant” varieties, however, are resistant only to certain common races of the red stele fungus and can become diseased if exposed to other races of the pathogen. New varieties are constantly being developed and released. Check with your nursery or local Extension educator to see if resistance to red stele and other diseases is available in new varieties. It is important to minimize the chance of introducing the red stele fungus into a field where it does not already exist. Buy nursery stock only from a reputable supplier, and take care not to transfer soil on farm implements from an infested field into a clean one. New fungicides active against red stele also help in controlling this disease but are most effective when used in combination with good soil water management practices. Figure 4. Some common strawberry root problems and typical symptoms.